A Midgett Blog » Blog Archive » Songfight! Mr. Michael Maas has been soapboxin’ lately in his blog about a new site he stumbled across called Songfight! I thought I’d weigh in with my own opinion as an impartial listener. The Songfight! formula is simple and strangely appealing: Each week the webmasters-that-be post three hypothetical song titles and open the door for anyone to submit a song with the same name. Writers have only a week to write, compose, record, and upload their song before the voting begins. When the deadline passes, the discussion, reviews, and criticisms (constructive and otherwise) begin to gather in the forums. Eventually votes are submitted and tabulated and, by the end of the next week, a winner is declared and is subsequently showered with the eternal love and adoration of the selfless Internet community. Or something like that, anyway. From the few competitions I’ve listened to, beginning to end, the songs range from very professional to embarrassingly amateur. Each competition has at least one .mp3 I want to save for later listening, but more than a couple songs are so bad that I can’t even listen to them all the way through. Reading the forums can be enjoyable and enlightening, but like any public forum on the Internet, Songfight! also has to put up with its fair share of forum trolls, and song-posting griefers. Mike’s first entry was for the “Fight the Sea” competition and he came in forth place with 14 votes. 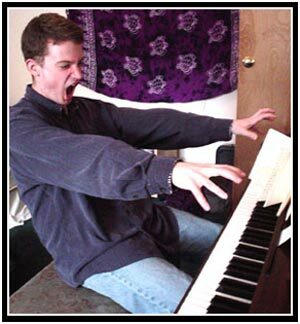 He’s obviously holding his own in a forum of very talented musicians. I’m looking forward to seeing how his sophomore effort, “Pass/Fail” makes out when they post the results of the voting next week. If you get a chance, navigate your way to the “Fight the Sea” page and listen to a few of the entries. You can download them individually, or simply click the “stream all” button to queue them all up (and more easily skip the real stinkers). After the voting results are posted, it’s usually pretty easy to separate the wheat from the chaff, but at least one of the underrated entries is worth mentioning: Jonathan Mann’s. In my opinion, this was one of the best songs in the fight, and I can’t understand how it could possibly have scored only five votes! It has a cool ukulele, great lyrics, and high production values. Compare that with the (admittedly hilarious) entry by Karl’s Mom that scored 20 votes and you’ll probably see what I mean. In my case, whether or not I like a song has far more to do with the music than the lyrics. In fact, on first listen, I rarely (if ever) give enough attention to the lyrics to even know what the song is about. (Hey, if I were really into lyrics, I’d probably love poetry, too. I don’t.) If the music is good, though, it’ll set the stage for multiple listens and eventually I’ll get the idea – some day I might even puzzle out the meaning behind the words. In the case of the song submitted by Karl’s Mom, the whole intro is a spoken-word comedy which sets the stage for a rather monotone song. There’s no doubt that the introduction grabs you. There’s so much humor packed into his visual description of the year “two thousand MILLION” that the song can’t help but be memorable. But is the music worthy of being in the top five? No way. I find that, for me, comedy is immediately accessible. Take the competition of a couple weeks ago (check the archive). The three song titles to choose from were: The Puppet’s Dream, Gettin’ All Sweaty, and Dinga Da Donga. The first two had their fair share of genre entries, but it was Dinga Da Donga’s songs that completely sold me on Songfight! I can’t usually can’t abide rap no matter how well done it is, but there were some truly awful songs done for Dinga Da Donga that I loved just because they’re were so damn funny! I have no idea if there’s a solution that could correct this problem – of if anyone should even try. It may not work, but perhaps Songfight!’s moderators should consider a different format for voting. I would think that casting weighted votes for your top three favorites would have a better chance of getting the cream to come out on top. Then again, I can imagine only too well the outcry some people would have over changing an established system (any system – some people complain just to hear themselves). Maybe if Songfight! gets popular enough to attract the masses, the inevitable vote cheating will force them into reevaluating their system. Songfight! has its problems, but even if only as a diverting radio station, it’s worthy of being placed on my list. If you find your way there this week, make sure you check out Mike’s “Pass/Fail” entry – and don’t forget to cast your vote! Oh, and the obvious disclaimer: Despite what my BLA degree might say, IANAM.